This is a remote wilderness area with no facilities. Bring your own drinking water as potable water is not available in the park. Mount Griffin is a remote park lying southwest of Three Valley Gap. It was created to protect a range of ecosystems, from valley bottom wetlands to alpine and subalpine environments. It consists of three separate areas, partially surrounding Mount Griffin Ecological Reserve. There is a small campsite in the park at Caribou Lake (west side of the park) and a Forest Recreation Site at Wap Lake (just outside the southwest corner of the park). 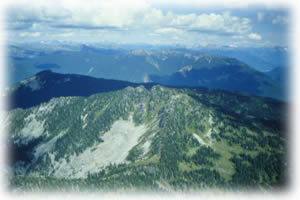 The west side of Mount Griffin can be accessed via the Yard Creek forest service road, beginning at Yard Creek Provincial Park. The Caribou Lake trailhead is about 20 km from Yard Creek Park. The road is rough and seldom used; four-wheel drive vehicles with good clearance are recommended. Caribou Lake is about 3 km from the end of the road on a narrow trail. The Wap Creek wetlands and Wap Lake can be reached using the Wap Creek forest service road, which starts at the Trans-Canada Highway just west of Three Valley Gap. While road conditions vary with weather, two-wheel drive vehicles can usually use this road in summer. Wap Lake is about 11 km from the Trans-Canada. History - Most the park has been unaffected by human activity. Railroad logging took place in the upper Wap River valley in the early part of the century. Conservation - The park extends from the Wap Creek floodplain to high elevation forests and alpine/subalpine terrain surrounding Mount Griffin, including the following biogeoclimatic zones: ICHmw3, ICHwk1, ESSFwc2, ESSFvc and AT-Ewcp. It has small stands of old growth cedar, hemlock and subalpine fir. Aquatic features include: Wap Lake, sedge and shrub wetlands, small ponds, sphagnum bogs and a meandering stream in the Wap Valley as well as ponds and wetlands at mid-elevations and in the subalpine. Wildlife - The park provides habitat for moose, beaver and other animals of the riparian/wetland forest. At higher elevations black and grizzly bears, mountain caribou and pine marten may be found. Approved Purpose Statement and Zoning Plan [PDF] for Mount Griffin Provincial Park is available online in pdf format. For your own safety and the preservation of the park, obey posted signs and keep to designated trails. Shortcutting trails destroys plant life and soil structure. This park has hiking and walking trails and there is a 3 km trail to Caribou Lake. Horses and or horseback riding on roads only. No horse trails. Swimming is possible at Wap Lake. There are no lifeguards on duty at provincial parks. Campfires are permitted. No firewood available. While campfires are allowed and campfire rings are provided at each campsite, we encourage visitors to conserve wood and protect the environment by minimizing the use of fire and using campstoves instead. Firewood can be purchased in the park or you may bring your own wood.Fees for firewood are set locally and may vary from park to park. Limited burning hours or campfire bans may be implemented. To preserve vegetation and ground cover, please don’t gather firewood from the area around your campsite or elsewhere in the park (this is a ticketable offence under the Park Act). Dead wood is an important habitat element for many plants and animals and it adds organic matter to the soil. This park offers vehicle accessible campsites on a first-come, first-served basis - campsite reservations are not accepted. One site at Caribou Lake and two forestry sites at Wap Lake.